Instead of performing the entire Mandatory Configuration (transaction SOLMAN_SETUP) first and then start with the content activation, you can carry out a few steps of the configuration, start content activation and then, while content activation is running, you can continue working on the mandatory configuration. This will lead to a significant business downtime reduction when you complete the following steps. 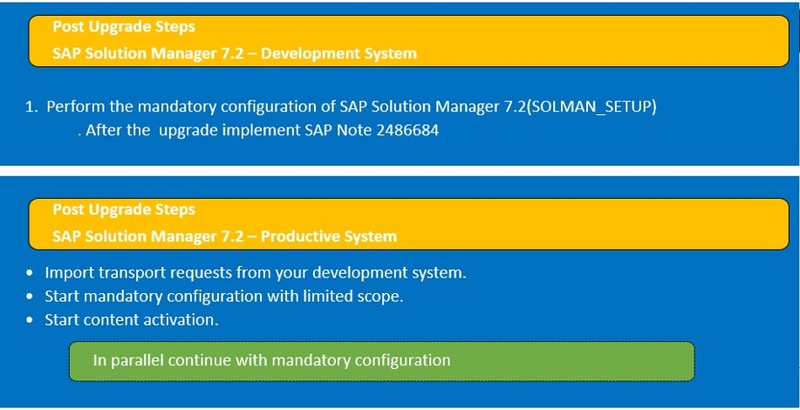 Perform the Mandatory Configuration of SAP Solution Manager 7.2 (transaction SOLMAN_SETUP). a .When having upgraded to SPS 5, implement SAP Note 2486684. Check that you have set the recommended ABAP system profile parameters as described in SAP Note 2048519 in preparation for the upgrade of your productive system. Import transport requests from your development system. a.Carry out the configuration step under Mandatory Configuration > System Preparation– > 1 Define System Role. b.Make sure that you have performed the note post-processing in the configuration step under Mandatory Configuration > System Preparation > 4 Apply Essential Corrections > – 4.2 ABAP Corrections. When upgrading to SAP Solution Manger 7.2 SPS5, skip the activity Check Virus Scan Profile Parameter activity, if it still exists, in the System Parameter step of the Mandatory Configuration scenario (see Perform the Post-upgrade Steps in Your Development System). c.Carry out the configuration step under Mandatory Configuration > System Preparation > Maintain Technical Users. Activate services under SOLMAN_SETUP > Basic Configuration – > 1 Configure Basic Functions > Activate ICF Services Activity. Start content activation under SOLMAN_SETUP > Post-Upgrade Activities > Solution Documentation Content Activation. In parallel, continue working on the Mandatory Configuration under SOLMAN_SETUP > Mandatory Configuration. https://help.sap.com/solutionmanager. Choose <Version> > Installation and Upgrade > Upgrade Guide. For more information about troubleshooting for the upgrade process, please follow SAP Note 2227300. You can also refer to the Content Activation Wiki at https://wiki.scn.sap.com/wiki/x/TY5tGw. For more information about troubleshooting and latest news on content activation, see https://wiki.scn.sap.com/wiki/x/ZDC7Gg. Hope above information is useful.